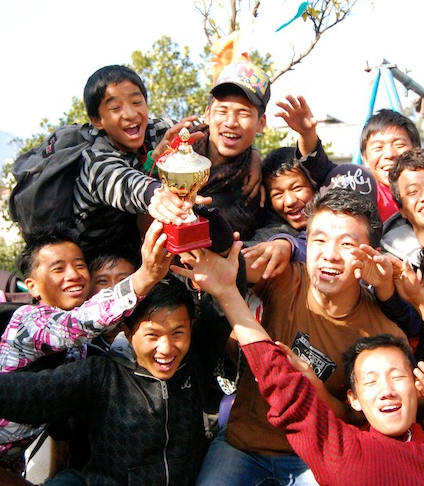 The annual Umbrella Christmas Cup was held, with Nepali time taken into consideration, on Saturday Jan 7th 2012. 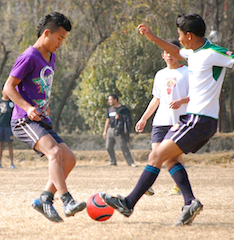 The football tournament, between the girls and boys of Umbrella, was a great day out in the local Nepali army camp for everyone in Umbrella as those not involved in the football were also able to enjoy the basketball and volleyball facilities. The opening game, the girls final between Gauri Shankar and Sagarmatha, was a very close fought battle with Gauri Shankar winning 1-0.The Junior Boys tournament, a tri-team competition between Manaslu, Kanchanjanga and a Mixed boys team, had some very close games before Manaslu were crowned worthy winners.Then came the Senior Boys tournament and the much-anticipated Staff versus Annapurna match, which didn’t fail to entertain. Annapurna narrowly came out on top with a goal in the second half putting them through to the final. There, Machapucherre, who beat the Umbrella Youths 1-0 in the other semi final, joined them. Annapurna went on to win and retain their Cup, but Machhapucherre didn’t make it easy for them with the final being decided on penalties..! A big thank goes to all the staff and volunteers who helped organize and run the event. Jamie Heaslip volunteers with Umbrella!